You don’t have to be a minimalist to pack lighter when you travel. It’s not about scaling everything down to the point where you claim you own just “five” things. 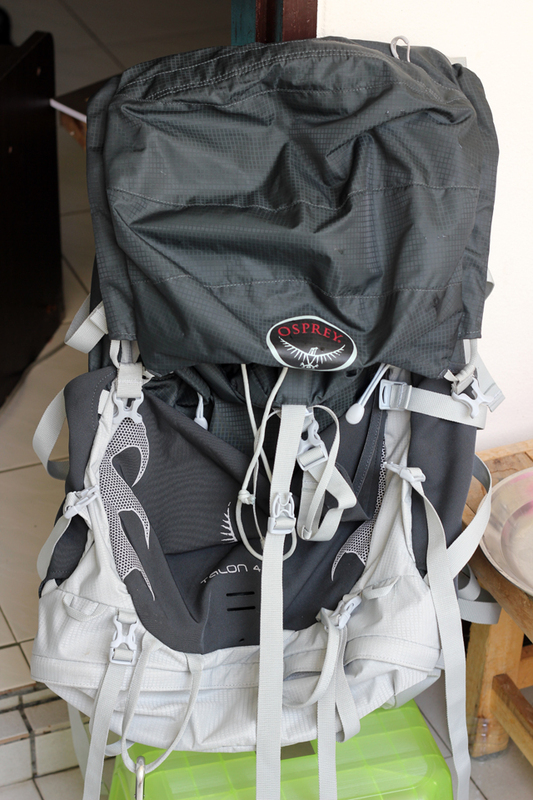 Instead, packing light is about being able to be flexible, to make taking transportation much easier to cope with, and just to save your back from suffering throughout your journey. You may have already seen my packing list, and here are 5 of the ways that I lower the overall weight and size of my backpack. This might be an obvious way to scale back on the things you bring with you, but seriously speaking, no matter what size our bag is, we’ll probably fill it up. Have you ever seen a backpacker walking about with a half empty backpack? No, in fact most of the time I see backpacks maxed out and overflowing with extra things hanging from strings and carabiners. Possibly the easiest thing to do when you want to pack lighter is to use a smaller bag – that way when your bag is full, it still won’t be too big. Clothing is one of those things that I see nearly everyone bring too much of. Sure you need the basics and you need a few extras, but do you really need seven shirts and seven pairs of underwear? I travel with no more than around three sets of clothes, sometimes with just two. Now of course, you have to take into account the weather conditions where you’ll be traveling, but really think about how many clothes you actually need. Remember you can wash your clothes in a sink each day or even buy new clothes wherever you are. 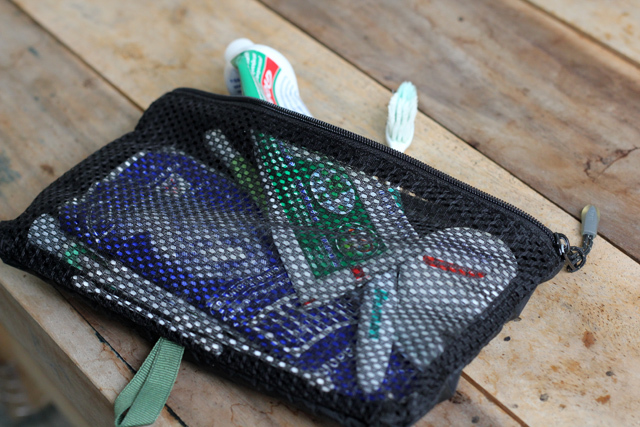 I’ve honestly seen travelers with toiletry kits that are nearly the size of my entire backpack! Stuffed inside are full bottles of shampoo, entire boxes of band-aids, facial creams and who knows what else. Depending on your own physical needs and comforts, you can probably still cut back on some of the unnecessary toiletries. Also remember again that just about everything toiletry wise will be available in the nearest store in whatever city you’ll be in. Shoes are extremely bulky and often quite heavy… but they are indeed important, depending upon where you’re going or the activities you’ll be doing. The way I travel, I bring one all-purpose pair of shoes which I use for walking, hiking or jogging and I carry one pair of flip flips which I actually prefer to wear the majority of the time. These two footwear options are probably all you’ll need for a normal backpacking trip and any extra footwear will only make your bag heavier with little use. I don't mean less reading material (I think reading is a great thing to do when you travel), but I do mean less physical reams of paper that are outrageously heavy. I know, it is really nice to have a physical book to read while you travel (maybe 1 or 2), but a whole stack of books may not be worth its weight. You can often find used books when you need them or trade with other travelers. Also consider an electronic book reader where you'll be able to store hundreds of books on a tiny device. When it comes to guide books, either don't bother at all and just rely on information you find online, or I've seen people tear only the useful pages out of guides and ditch the useless portion. I’m an advocate for traveling the way you feel most comfortable and we each have our own unique wants and needs. However I strongly believe that lightening the load is directly correlated with getting the most out of your trip. These are just 5 suggestions, but there are countless other ways you can cut weight from your bag, so you can travel with ease and give your back a break! It’s hard for guys too. In addition to my hiking sneakers, and flip flops, I’m also now carrying Adidas for use in the big cities (and for dancing). Sometimes I want to ditch one pair of sneakers or the other, but they both serve their purposes so well. hehe I love that boys have the same issues. I think 3 pairs is impressive so you’re doing well in my book! I understand Katherine and Dave – while I think traveling light is beneficial, being comfortable and having the things we really need overpowers trying to pack light. I know we all have a few individual things that we shouldn’t give up even for lightness. I for instance carry my camera and a few lenses everywhere I go, and I don’t think I’ll ever give that up. Kinda funny, stumbled here thinking backpacking (as in hiking), but as luck would have it the advice was relevant to both styles of backpacking (hiking and traveling). I enjoy both and completely subscribe to the lighter is more flexible philosophy. I have been trying to figure out how little I can take on a trip to Croatia in a few weeks so this just solidified my plans a bit. Great to hear that Nathan. These ideas do hold true for a hiking trip as well, just need a few extra survival things. Have a great time in Croatia! Yep, cutting the clothes out is an easy way to cut the size and weight. And getting a smaller bag is the obvious but often overlooked way of reducing your load. And I definitely agree that you can get much more out of your trip with less of a load–makes you much more maneuverable and is less stressful and it’s less to lose (or get stolen)! I also think the less you carry, the less likely you are to forget stuff. It’s easier to keep a mental inventory when you’ve got less things. I don’t completely agree with the less cloth point. or maybe it’s because I don’t want to spent time washing my clothes every other day so the 7 shirts/t-shirts just work for me so I just have to do my laundry once a week, everything goes in the same machine. Done Deal. So far the only thing that I have taken with me and haven’t had any use so far (touching wood) is my first aid kit. It takes quite some space and I don’t even really remember what’s in it. I think that in the next few weeks I’ll get rid of it since the only time I hurt myself, I went straight to the pharmacy anyway. I started packing much lighter and love it now. I’d always come home with my bag half full of clothes I never wore. Seriously about 20 minutes of actually sitting down to think about what I’m going to bring saves a ton of space. I also try to pack in similar color tones, that way everything matches and I don’t need to load up on extra shoes. And of course I never travel without my beloved Kindle Fire!